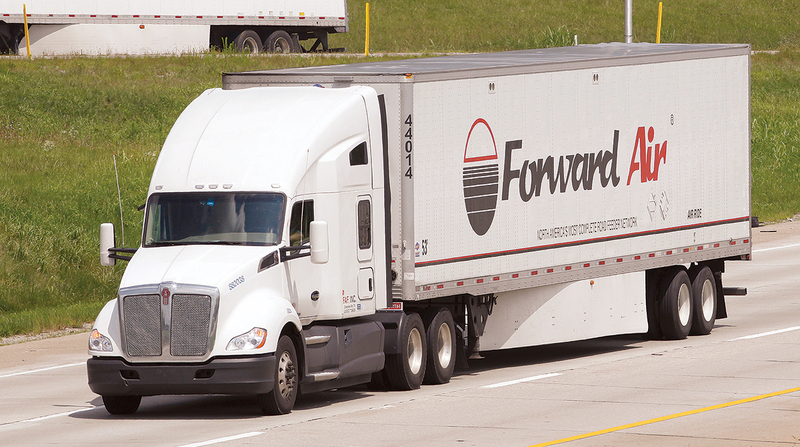 Forward Air Corp. had a steady third quarter with its numbers slightly topping analysts’ forecasts, indicating the for-hire carrier is moving at a measured pace for the year. Forward Air reported third-quarter net income of $18.2 million, or 60 cents per share, compared with net income of $11.9 million and 39 cents a share in the third quarter a year ago. The Bloomberg News consensus forecast of analysts called for 58 cents per share on net income of $17.6 million. Revenue for the three-month period ending September 30 increased 12.3% to $280.2 million, besting the forecast of $279 million. Revenue in the year-ago period was $249.6 million. Greeneville, Tenn.-based Forward Air operates four units — Expedited Less-than-truckload, truckload, Intermodal and pool distribution. The expedited LTL unit reported a revenue rise of 7.9% to $155.7 million, leading to a 10.5% rise in income to $23.2 million. Total operating expenses came in at $132.5 million. Tonnage grew, with 50,477 average weekly pounds, up nearly 10%, while total pounds rose 8%. The truckload unit grew revenue 8.8% to $45.9 million. However, operating expenses rose nearly 14% to $45.8 million, leading to income of just $100,000, down from $2 million a year ago. Insurance and claims expenses jumped nearly 82% to $2 million for the group. The intermodal segment had a strong quarter with revenue rising more than 53% to $42.3 million, and profits of $3.5 million, a rise of nearly 17%. The success of the unit came despite an 80% rise in purchased transportation expenses to $17.5 million. Pool distribution had income of $700,000, up from $100,000 a year ago. Forward Air ranks No. 37 on the Transport Topics list of the Top 100 for-hire carriers in North America.